Why AV dissociation does not occur in all patients with ventricular tachycardia ? AV dissociation is the most specific diagnostic clue in VT.But this is not a constant finding. In fact one would be lucky to spot a fusion beat which denotes AV dissociation . It occurs in less than 30% of patients with VT .
Technically , for AV dissociation to occur atria and ventricle should not be related in either direction . If there is a retrograde VA association ante grade AV conduction is not possible and hence one can not get a fusion beat or so. What happens to p waves during VT ? How does atria depolarise during VT ? Atrial chambers can not sit idle during VT .It has to somehow get depolarized and contract but the timing may not be appropriate . P waves during VT can either be antegrade or retrograde . Theoretically both can be present but most times it is the retrograde p waves we see. The occurrence and timing of p waves is related to the VA conduction . If there is 1 :1 VA conduction during VT there can not be AV dissociation for the simple reason we have VA association.In fact there is constant vigil to depolarise the ventricle through the normal AV node and his purkinje in spite of the VT .SA node is aware of this fact , how difficult it is going to be confront the upcoming rapid ventricular impulse . Usually the ventricular impulse prevails over the atrial impulse and much part atria is controlled by the VT . In fact the VT reaches all the way to SA node and simply overdrive it . At these fast heart rates retrograde p waves are not visible. ( But surprisingly one may see a regular cannon wave in the neck with 1: 1 VA conduction. Mean while , the SA is always under look out for a opportunity to sneak into the ventricles thorough AV node. This happens when the VT focus slightly slows down or shifts to a new site . this sis the time we are able to witness the AV dissociation . When the atrial impulse capture fully or partially the ventricle fusion beats occur confirming AV dissociation . AV dissociation is present in less than 30% of VT because in 70% there is a VA association. (Retrograde VA conduction ) . When V is associated with A there can not be AV dissociation. Do not undermine the Importance of “Poster presentations” in scientific conferences ! We do come across , even senior cardiologists , who tend to undermine the importance of poster presentations in scientific conferences (I know a few , who ridicule it as well ? ) . Is it not a meanly job for a cardiologist to paste a poster and stand beside it for hours , waiting for scientifically motivated audience ! But , what really matter is the thoughts , concepts and often the hard work that brings these posters to big league conferences . Please remember abstract posters must cross the hurdle of the conference peer review committee’s scrutiny . Often times the poster arenas has launched some crazy ideas , transform them to great discoveries. 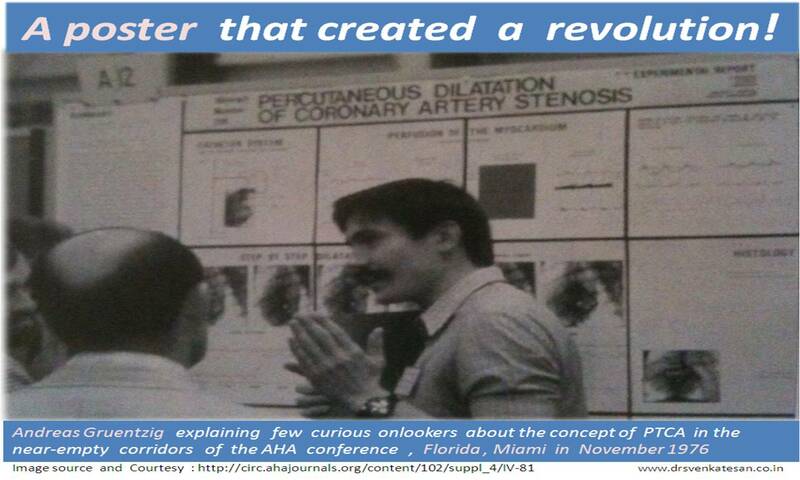 1975 . . . the revolutionary concept of PTCA would still be in utero ! I argue the young fellows in cardiology to send as many scientific abstracts as possible in their national or international meets . This is where the the future of cardiology lies ! Simply don’t bother about the critics . When VPDs continuously bombard the ventricle . . . Mitral valve begins to leak ! There are many organic causes of mitral regurgitation. ( Ischemic , degenerative , valvular , cardiomyopathy etc.) 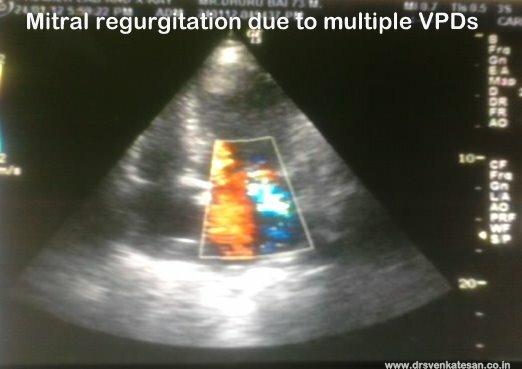 It is not rare for pure electrical events to result in valvular regurgitation. A 70year old man with SHT presented with palpitation and exertional dyspnea .He was later referred for Echocardiography. Echo revealed LVH with intermittent MR and moderate LV dysfunction. 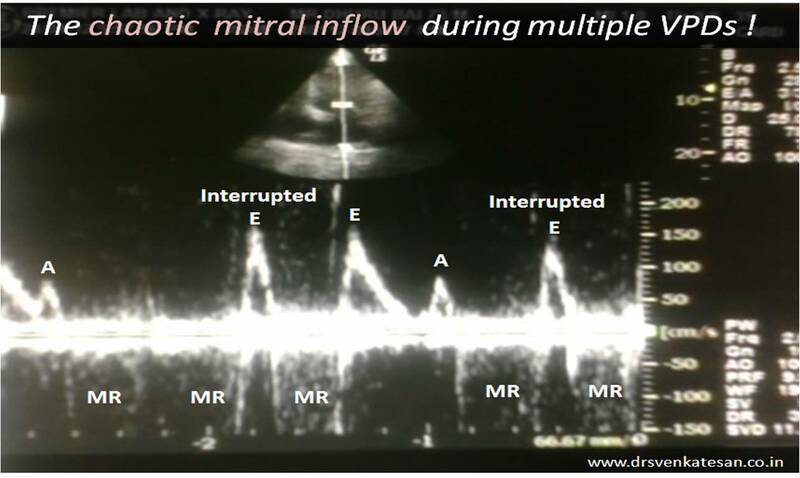 His echo showed randomly timed mitral regurgitation was detected .See the Doppler MR jets below. We know ventricles are integral part of mitral valve apparatus .Hence it wouldn’t be a surprise to note abnormally timed ventricular contraction can have a major impact on mitral valve function. When ventricles prematurely begin to contract ( As during VPDs) it interferes with opening of mitral valve. In other words every VPD technically imparts a sort of diastolic dysfunction ! VPDs occur in which part of cardiac cycle ? What would be the status of mitral valve at times of VPDs? Though it depends upon the timing of VPD , generally it interrupts the rapid inflow period of diastole . * Is that a funny imagination ? During diastole , if LV suddenly begins to contract instead of receiving the blood , what will happen ? VPDs are such a common arrhythmia , we rarely wondered , it can have a dramatic consequence in a any given cardiac cycle .While the cardiologists think too technically their patients observe with shrewd sense and tell us clearly what they feel is actually a missed beat ! Just imagine , if a patient has multiple VPDs with different coupling intervals that fall in different location of diastole also interspersed with sinus beats , how chaotic would be the the mitral filling . This is what is recorded in the above patient with multiple random MR jets . Why all VPDs do not cause MR ? The timing is critical .We know all VPDs do not generate a powerful contraction to cause MR. Atrial fibrillation, Prolonged PR intervals , heart blocks , critically raised LVEDP all can influence the trans mitral gradient . In fact these situation can result in an entity called diastolic MR that would be discussed later. Can VPD induced MR be referred to as diastolic MR ? When VPDs occur in diastole , it interrupts the diastole and a new systole begins. In any particular point of time there will be leak into the LA if the mitral valve is open .This is technically a new systole but in true sense it is the diastole of the previous beat . I wonder , whether VPD induced MR may be referred to as one form of diastolic MR. Of course , this MR can spill over to true systole as well . This also makes sense (Non !) as many of the VPDs do not open the aortic valve , hence technically we can’t call the phase reset by all VPDS as a true systole ! What is the effect of VPDs on pulmonary venous flow ? Left atrial cannon waves can occur that can elevate PCWP .This is the prime reason for resting or exertional dyspnea in these patients. Some may get a paradoxical relief during exertion as exercise suppress VPDs which are frequent at rest. If VPDs can seriously interfere with mitral valve function , why they are often considered benign ? VPDs though considered largely benign , can lead to dramatic alterations in the functions of mitral valve , especially in diseased hearts. We must realise when ventricular ectopic beats occur frequently , it interfere with the both opening and closing of mitral valve. It is really surprising , the literature is devoid of major studies about the impact of VPDs on mitral valve physiology . . . rather pathology ! Iam sure . . . 9 out of 10 times , this ECG will mislead you ! This is the ECG of a 45 year old man with H/O hypertension and chest pain .The general practitioner who first saw him alerted this patient about a possible heart attack asked to meet a cardiologist immediately. The cardiologist who saw this ECG tended to confirm the diagnosis and advised admission in a coronary care unit . The patient defied both and somehow landed in my echo lab . Looking at the ECG I also expected it to be a STEMI evolving into a Non Q MI . I was surprised to find only LVH with absolutely no wall motion defect . There was no evidence of ASH, HOCM or apical cardiomyoapthy as one of my fellows initially suspected . His EF was 70 %. Cardiac enzymes were sent by then. When I spent few minutes with him , listening the history , it was very clear what he had was non cardiac pain . In the anxiety , no one got it right about the character of pain ,which was localised , lasted for few seconds and least suggesed angina. 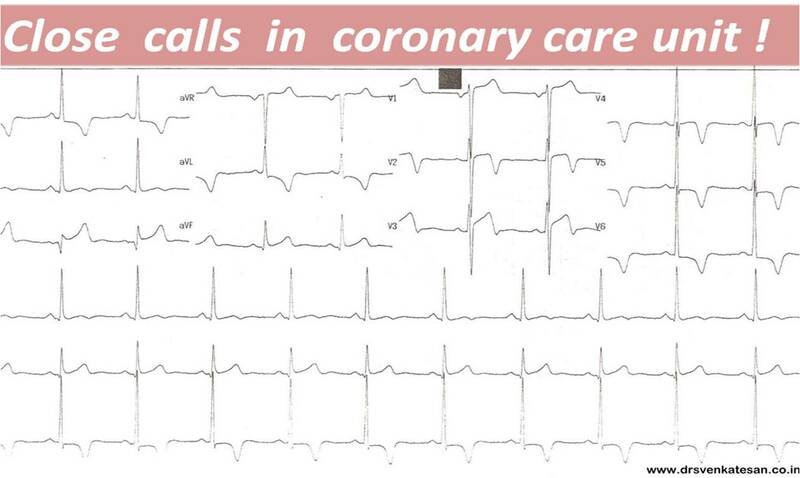 The moral of the story is listen to the patient however dramatic the ECG may look ! What is special in this ECG ? Here , there were other observations that added more complexity . In LVH it is usual to note ST depresion , how do you explain ST elevation in LVH ? ST elevation in LVH may occur in leads v1 to v3 . It is very rare for LVH to inscribe ST elevation in v4 v5 v6 . Why certain leads elevate the ST segment while others depress in LVH is not clear. It may represent incomplete LBBB pattern where the ST segment deviates opposite to the dominant QRS complex. 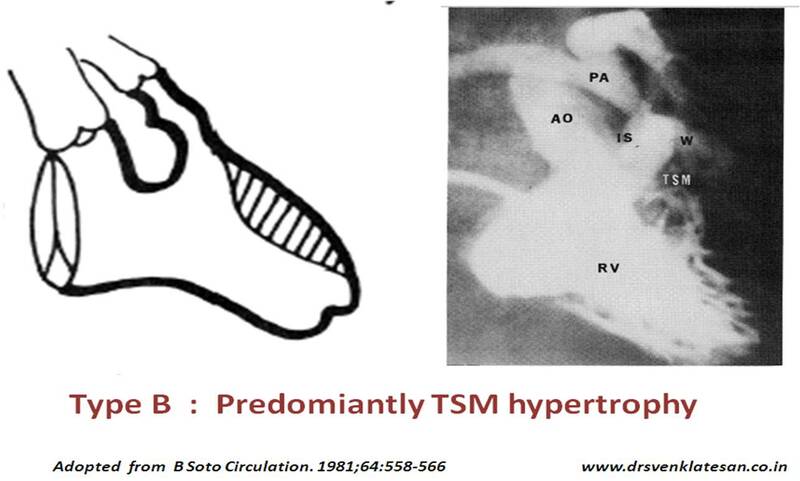 Septal hypertrophy often elevate while free wall hypertrophy depress the ST segment . Since V5,V6 leads are free wall oriented , these leads record classical ST depression . Please remember Bi phasic T waves are notorious for it’s unpredictability. 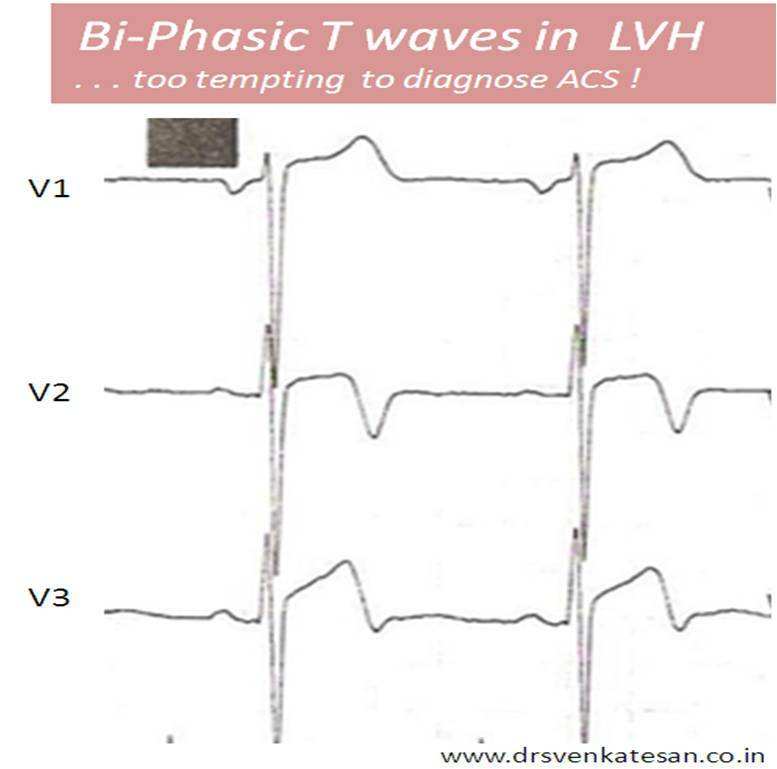 An innocuous looking bi-phasic T waves (especially with dynamic behavior ) is a harbinger of proximal LAD or even left main disease. 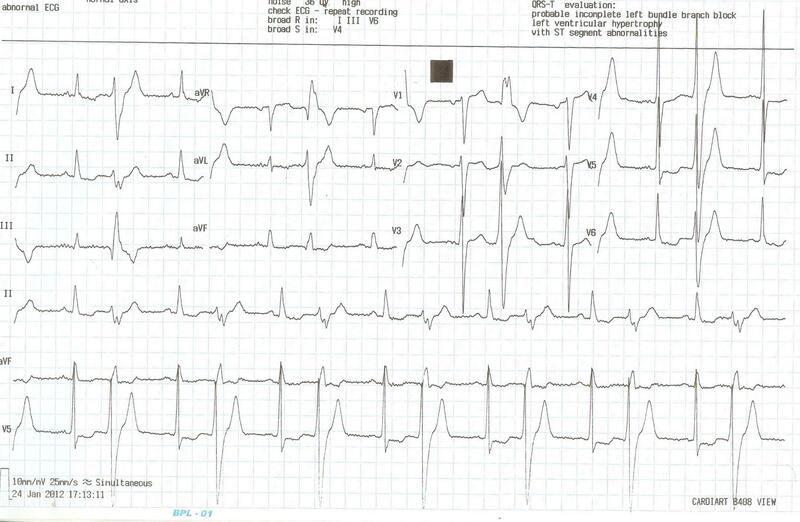 Finally , what will be ECG changes if a patient with classical LVH who develops a real STEMI ? LV strain pattern normalises ? Further ST depression occurs ? No great changes . ECG Looks near normal ? What is the mechanism of Amlodipine induced edema legs ? Note : I lost track , the source of this Image .I thank with courtesy whoever has created this Image . It is primarily a local phenomenon . The calcium channels are primarily arteriolar dilators . Since the venules lack much muscle they are not much affected by the Amlodipine . This facilitates flooding of venules and leaks into the peri venular interstitial space. 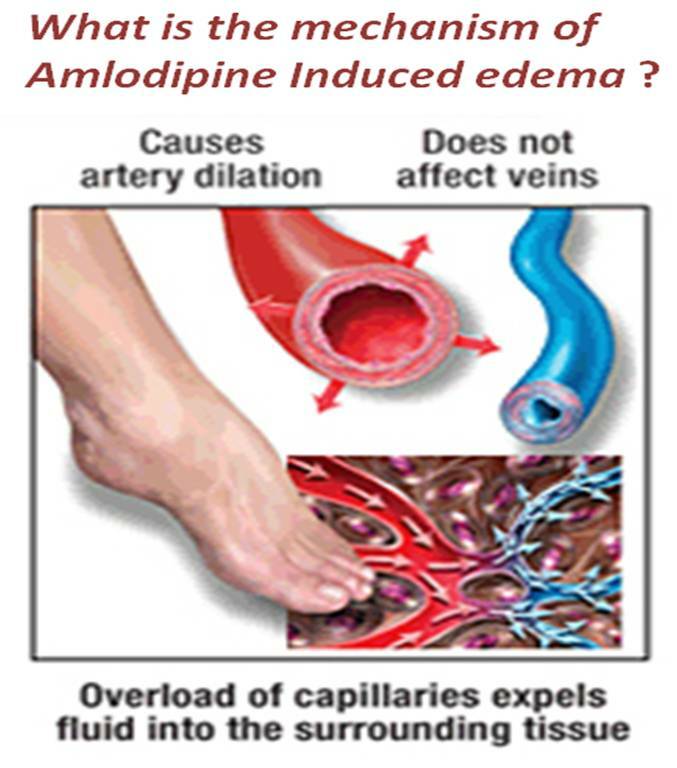 It may be apt to call Amlodipine induced edema as a form of local venous edema . This results in near permanent collection of fluid especially near the ankle . Systemic fluid retention has no major role . However few patients may show an augmented RASS response due to sudden arteriolar dilatation . In these patients addition of ACEI or ARB may help relieve edema legs .The Amlodipine induced edema is dose and time dependent .(Cumulative) . It is mostly benign in nature , rarely warrants withdrawal of the drug. The edema can occasionally be generalised and weight gain is possible . Other factors that increase the chance of edema is age , women , obesity. They have loose interstitial tissues.Many especailly women complain tingling feeling in the edematous zone. Can we use diuretics to treat Amlodipine induced edema legs ? Hydrochorthiazide is rarely useful as the primary problem is not in the renal retention. How to treat Amlodipine induced edema ? Unfortunately the popular combination with diuretics do not work . Angiotensin inhibitors which has some veno dilatation is shown to reduce this edema . ( COACH study . Olmesartan / Telmisartan combination is an option ) .It defies logic , to add another anti HT drug for the sole purpose of reducing the side effect of the initial anti HT drug . Ideally if your patient is not tolerating Amlodipine due to edema , switch to an another group of anti HT drugs. Aspirin under attack . . . for wrong reasons ? Aspirin under attack . . . not by Gastro-enterologists this time , but by cardiologists themself ! 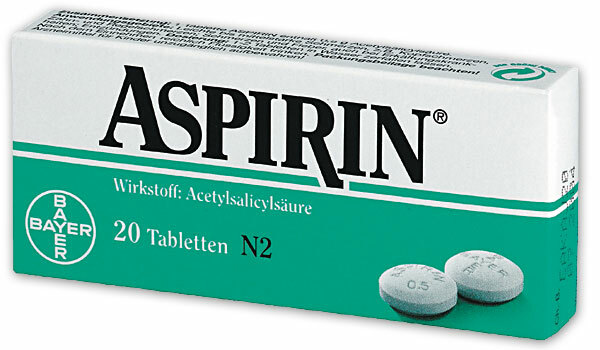 Aspirin , after all may not be safe , as a primary prevention drug against CAD . It seems , it considerably increases the risk of bleeding . The new meta analysis just published in Archives of internal medicine says so ! Be cautious it concludes ! Since the track record of evidence based medical science ( and its reproducibility ) looks pathetic in recent times , we may expect another stunning study very soon , with an exactly opposite conclusion ! So , we have a “vacancy in the top slot” for primary prevention of CAD . Mind you , makers of Prasugrel and Ticagrelor are already fastening their seat belts ! What are the various types of RVOT obstruction in Tetrology of Fallot ? RVOT obstruction is the sine qua non of TOF. It is traditional to believe the obstruction in TOF is dynamic and is located in the infundibulum. It may be true in a broad sense .But in reality the blood flow faces too many hurdles within the RV before it reaches the pulmonary artery and lungs there after. The commonest and most important one being the mal-aligned conal septum encroaching the infundibulum . 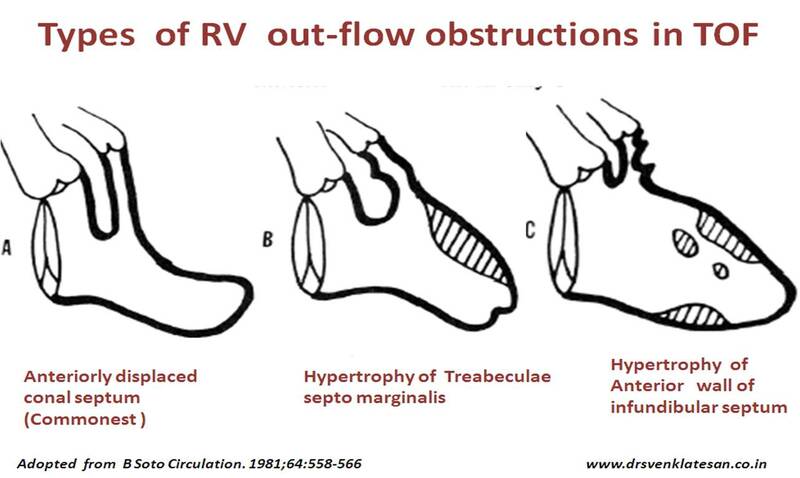 (This anterior migration of conal septum is responsible for the aortic over ride and VSD as well) .It is erroneous to think the RVH in TOF is simply an after effect of RVOT obstruction .There can be intrinsic defects in the RV trabecuale that hypertrophies and traverses the RV cavity in randon fashion. What are the fixed obstruction in TOF ? 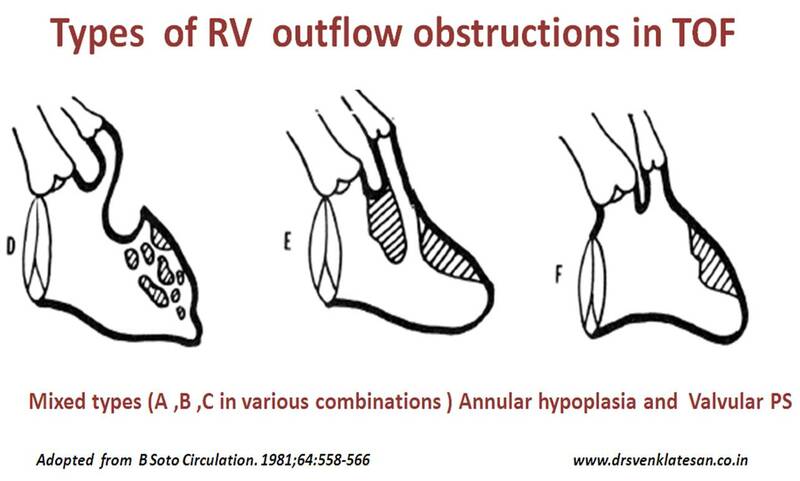 The resistance to blood flow within the RV is often multiple , extend from RV body to pulmonary arterial branch points. It is important to realise few of the obstructions are fixed in nature. Differentiation of dynamic vs static obstruction is important in therapeutic aspect also. The efficacy of beta blockers is directly related to the ratio of dynamic vs fixed resistance . So, fellows beware if some one asks this question “Where is the site of obstruction in TOF ” .Be ready with an elaborate answer . It is better to classify according to sites of obstruction with specific reference to dynamic or static nature .